Spend a day with experienced instructors, learning essential skills for the Irish mountains. Learn to navigate using a map and compass. Discuss the essential equipment to carry in your backpack. Discover different mountain hazards and how to deal with them, or more importantly, prevent them from becoming a hazard in the first place. The day will be spent in the mountains and will run from 10am to 4pm. The promotion is running in Glenbeigh, Kerry and Glendalough, Wicklow. I am running this free promotion to launch my 2009 dates for the official Mountain Skills Training and Assessment Courses, running both in Kerry and Wicklow. The promotion is sponsored by Sport Corran Tuathail, Killarney's Outdoor Shop, and now available online at www.sct.ie. To book your place contact Nathan on info@outdoorsireland.com or 086 860 45 63. Give someone a present with a difference! A gift voucher for a day's rock climbing & abseiling, a kayaking trip or a hike into the Kerry mountains! Personally designed day and half-day gift vouchers. Prices from €50. Contact Nathan for more details. You use a compass for navigating across the hills in mist or in darkness. Especially useful for descending safely off the hills in darkness. 1. Place the compass on the map, so that the long edge of the compass passes through your current point and the point you wish to travel to. 2. Ensure your direction of travel arrow on the compass base-plate points from your current point to the point you wish to travel to. 3. Hold the base plate tightly on the map. 4. Carefully rotate the compass wheel until the red and black lines on the bottom of the compass wheel are parallel with the blue map grid-lines, which run from top to bottom (north to south). 5. The red lines on the bottom of the compass wheel need to point to north on your map (top of map). 6. The black lines on the bottom of the compass wheel need to point to south on your map (bottom of map). 7. Double check the long edge of your compass still passes through your current point and the point you wish to travel to. 8. Remove the compass from the map. 9. Hold the compass flat, directly in front of your chest, with the string towards you and the direction of travel arrow pointing away from you. 10. Physically turn yourself around slowly until the red tip of the moving compass needle lies on top of the red tip of the arrow on the bottom of the compass. 11. When you look straight up you are now looking along the line which you need to travel to reach your next point. 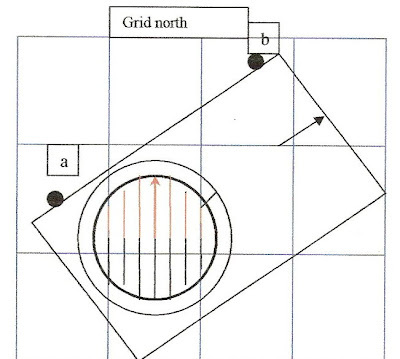 In the next newsletter find out about Magnetic Variation and Following a Bearing. After a busy summer I decided to take three days off, pack a fifteen foot sea kayak with food and drink and explore the south west coast. My plans happened to coincide with what was probably the summer’s best weather. I paddled out from Snave Strand, at the head of Bantry Bay, on a beautiful sunny afternoon. The gentle southerly breeze barely stirring the water. For the entire afternoon I couldn’t wipe the grin from my face as the coastline of the Beara Peninsula unveiled itself, in all of its rocky rugged beauty. With my heavily laden kayak a little tippy to begin with, until I became accustomed to it, I hugged the coastline. Past Whiddy Island Oil Refinery and Glengarrif Harbour. After a couple of hours paddling my stomach began to let me know it was past lunchtime, so spying a huge black rock protruding from the water I made for it. Leaving my kayak tightly wedged between slippery rocks I scrambled to the summit, passing numerous orderly piles of twigs spread across the flat top, which on closer inspection turned out to be abandoned gannet nests. Invigorated after a lunch of freshly baked bread, slightly warm goat cheese and tomatoes I hit the water knowing I needed to make it to Bere Island to be assured of a good camping spot that night. This was a long paddle; head down; long deep strokes for three hours, cutting down the middle of Bantry Bay to take the most direct line. Roancarrigmore, a tiny island with a lonely lighthouse perched on it, was my first target. Once I reached this little island I knew Bere Island was only 2km further. Slowly, but eventually, my destination became closer and closer. With the wind increasing, the temperature dropping and the sun setting I was eager to land and set up camp. Hugging the outside of the island I paddled into a calm natural bay called Lonehort Harbour. Landing my kayak on a white sandy beach, I pitched my Vango tent in dusky twilight, fixed a line between two gorse bushes to dry my kayaking gear and climbed into my tent. After the compulsory ‘I’m still safe’ text messages I set down to the serious job of cooking dinner, making several cups of tea and attempting to open a bottle of red wine with a penknife! Paddling along the outside of Bere Island was impressive, with the British gun batteries and bunkers disappearing slowly under an unstoppable tide of nettles and gorse. A Martello Tower from the Napoleonic Wars thrust bluntly into the blue sky, while nearby nestled a Megalithic Burial Site and a romantic looking promontory fort, probably Iron Age or earlier. Bere Island has a rich history and played an important part in World War 1, only being returned to the Irish in 1938. I left Bere Island, crossing the mouth of Castletown Bere Harbour and passing a solitary fishing trawler which threw up a lazy wash behind it. It was now I began to feel I was sea kayaking for real. Bantry Bay widened before me, miles of open water, the Beara Peninsula on my right, steadily increasing cliffs, headland after headland curving out of sight. While on my left the Sheep’s Head Peninsula slowly tapered to a finish, exposing open sea beyond it. Deciding to land for lunch is a decision that has to be well planned, as even in the gentle swell I was encountering, it’s no mean feat to land safely. Locate a section of rocky shoreline which doesn’t look too slippery, judge the swell as it surges upwards against the black rocks and rushes back down, sucking and gurgling. When a calming in the incoming swell seems imminent paddle alongside the rocks, timing it with the upward surge of salty water, pull off the neoprene spray deck, slide out of the boat onto the rocks and as the water begins to rush back downwards grab the handle and heave the boat onto the rocks, while all the time keeping the paddle securely in one hand! Feat successfully completed, I looked around my picnic spot. I had landed in a narrow inlet, which was basically a cleft in the cliffs. There was just enough space to drag my kayak onto the warm boulders which made up the floor. On one side was the water, now appearing docile. On the other three sides were vertical sandstone cliffs which towered overhead and thrust most of this inlet into shade. At the very back of the cleft were the scattered ancient remains of a Massey Ferguson tractor, which I guessed a weary farmer had pushed (or driven) over the edge. I sincerely hoped that with the progress of REPS and environmental awareness there would be no more dumping while I sat there enjoying my lunch. Technically launching from the shore after lunch should have been easier. A case of sitting into my kayak on the rocks, gripping my paddle tightly and when the right sized surge of water rose upwards seal launch myself into the swell and paddle away. Not the case! I ended up with the bow of my kayak in the water and my stern still perched on the rocks. Because of the sharp narrow shape to the kayak’s hull as the swell rushed downwards I capsized and then slithered the rest of the way into the water upside down. After the initial shock and realisation of how cold the water actually was I Eskimo rolled upright, shook the water out of my ears and vowed to find easier picnic spots in future! My intended destination that evening was Garnish, a 21km paddle away from lunch. The security of the mainland was left behind as I cut straight towards Crow Head, avoiding the many indented bays and inlets. Crow Head was the furthest into the Atlantic Ocean I strayed. As far as I know it’s the most south westerly point of mainland Ireland. And it felt it… Medium, choppy swell rolled under my kayak from random directions, making me constantly adjust my balance; my face stung from two days of sun and sea salt; gannets on the lookout for mackerel soared and cried overhead, before diving in unison; the water roared and boomed against the cliffs on my right; no one else by sea or land for miles and miles. At one stage I stopped paddling and simply sat still, bobbing in the edge of the Atlantic, savouring the peace and tranquillity. To save time and for a little more excitement I wanted to paddle through a narrow, tight passage between Crow Head and Crow Island. The passage, or channel, was three hundred metres long and at it’s narrowest I doubt I would have had the width to turn my kayak around. Carefully entering into it was like paddling into darkness, such was the difference between the dazzling sunlight and the gloomy shade. I emerged into a large calm bay with Dursey Island and Dursey Sound in front of me. The difference between one side of the three hundred metre channel and the other side was like stepping from a storm into a swimming pool! The sun was beginning to dip towards the horizon line and thinking about pasta and tomato sauce and warm red wine I put my foot down. Cutting through the bay towards the Sound, a couple of dolphins suddenly appeared and began accompanying me. Then there were six of them! Streaking through the water in pairs, jumping high into the air alongside me and carving in circles around my kayak. Most spectacular of all was when they dive bombed towards me from deep underwater. From the depths they would race straight upwards aiming directly at my kayak, I could see their pale stomachs as they sped at me, then at what seemed like the very last minute they would veer sharply off and avoid me. The twenty minutes I spent paddling towards Dursey Sound accompanied by six friendly dolphins was the high point of my trip. I left the Sound, passing Mealaun Point on my left, and veered sharp right, heading towards Garnish Point and safe harbour. Although the swell wasn’t huge it was the largest I had encountered so far. It rolled slowly under my boat, then seemed to accelerate towards the vast overhanging black cliffs, which glistened wetly in the sinking sun. The waves crashed in great echoing booms sending spray high into the air, where it seemed to hang in slow motion. The gentle hillside above the cliffs seemed hazy with mist which, on looking closer, was actually spray blown high into the air. I couldn’t see the water my boat was moving through! I was paddling through a thick carpet of dirty white foam which covered the water’s surface all around me, absorbing noise. Every time I did a forward stroke my paddle blade and sometimes my hand disappeared into the foam, which had a bit of a surreal feeling to it. Leaving the foam and echoing booms behind me I circled Garnish Point, surfed through a narrow gap between Garnish Island and a smaller unnamed island and landed on the rocky beach of Long Island. It felt good to stand up and stretch. That night, propped against a comfortable rock in my trusty sleeping bag, I watched the moon rise, sparkling on the still waters of Allihies Bay; and later slept under the stars beside my driftwood fire. Dazzling sunshine woke me the next morning and the sounds of local lobster fishermen preparing for their day’s work. After a lazy start I paddled to meet a friend who was joining me at Allihies Beach for my final day’s kayaking. We circumnavigated Cod’s Head and headed across the wide open expanse of Coulagh Bay, aiming for three small islands huddled off the tip of Kilcatherine Point. As Noel and myself paddled and chatted I heard a snorting noise from my left and glancing over saw, ten or fifteen metres away, the crest of a big, big dark-bluish back rising out of the water. It was a large whale, less than fifteen metres away! Only the crest of its back was breaking the water, and that was big, so I can only guess how big the entire whale was! Ignoring us (or oblivious to us) it sank below the water heading towards Lamb’s Head, on the Iveragh Peninsula. Later in the day we caught one or two more sightings of probably the same whale, far in the distance; cruising the deepening waters of Kenmare Bay, in no hurry to be anywhere. Having the safety of another person with me gave me the confidence to really explore the caves and strange rock formations eroded into the three small islands; Bridaun, Bridaun Beg and Inishfarnard. We landed in a little narrow inlet on Inishfarnard for lunch and stretched out on warm soft grass to enjoy sandwiches, grapes and chocolate chip cookies, while wondering how the sheep had managed to land on these rugged shores. All I can say is what a trip! Thanks to Edge Adventures Sea Kayaking and Sport Corran Tuathail for sponsoring this fantastic weekend! Sport Corran Tuathail are Killarney's Outdoor Adventure Shop, based in the Outlet Centre, and also available online at www.sct.ie. They stock a range of sit on tops, kayaks and all the other essential personal and safety equipment. I was one on the lucky one's to attend the white water promotion last week-end, and all I can say is that it was the best Saturday afternoon I have spent in a long time. The professionalism and good humour of the entire team of instructors was exceptional. We were in a group of three and we had a great laugh while learning some of the basic skills. I have dabbled about with kayaks in the past, but this has given me a taste to progress and identify which type/style is best for me before I invest in a boat. Hope to follow up with a 2 day course. Three of us spent an afternoon on a taster course of white water kayaking with Nathan Kingerlee and Edge Adventures Sea Kayaking in September by the lovely Beaufort Bridge in Kerry. Apart from having great fun and getting a good feel for what the sport entails, the whole set-up was very professional and well run in a seemingly effortless kind of way (that, of course, is never effortless). One of us is hoping to go back for a two-day course, one of us is dithering and I think ocean kayaking is the one that rocks my boat (awful pun intended). Thanks to Nathan, Sport Corrán Tuathail and Edge Adventures. 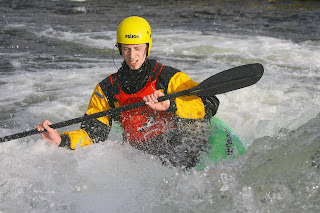 Click here for details of Learn to Kayak & Kayak Skills Courses!